Tell Austin Resource Recovery–Composting First! (This originally appeared in the Austin EcoNetwork blog). Austin’s recycling department, Austin Resource Recovery (ARR), has released a survey asking residents about two proposed ideas for reducing waste – upgrading the existing curbside recycling program to weekly service, or launching a new service for city-wide curbside composting. Of course we want both of these to happen – but unfortunately, politics and economics mean that the department almost certainly won’t be able to do them both at the same time. 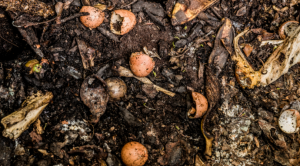 We’ve put a lot of thought and effort into it, and Texas Campaign for the Environment believes that city-wide curbside composting should be the top priority right now. Composting will make a bigger impact by reducing more waste. Curbside composting will capture an entire new class of materials that most families currently have to throw into the landfill. Yes, a lot of folks compost in their backyards or gardens, but the vast majority of families don’t. Furthermore, things like meat and bones, dairy, pizza boxes, napkins, paper towels, and other food-soiled papers aren’t easy for anyone to deal with in the backyard. They can go in the new curbside composting cart, so almost every Austin family will benefit. We would also benefit from weekly recycling, but the overall waste reduction wouldn’t be as dramatic because most Austinites already recycle – our participation rate is almost 90 percent. If we don’t compost, on the other hand, these materials decompose in landfills and produce methane gas, a greenhouse gas many times more powerful than carbon dioxide is in the short run. Curbside composting is a huge part of doing what Austin can to stop or limit climate change. Still, what about the families with too much recycling for bi-weekly collection? First, any Austin Resource Recovery customer can get a second recycling cart for free. And if you currently have a 64-gallon cart, you can upgrade to a 96-gallon cart without charge. If this doesn’t work you can always just set another box with excess recycling next to your cart. Finally—and most importantly—we all need to do a better job about REDUCING our consumption before we even get to recycling. Making smarter purchases to avoid packaging up front is actually better for the environment than recycling. A study of Austin’s trash last year did find that almost half of what we are sending to landfills could be recycled, and ARR believes that weekly recycling would bring more material into the blue cart. A big chunk of the trashed recycling they found, however, is soiled paper that should actually be composted, not recycled. That means we can divert the MAJORITY of our trash with a good curbside composting program. Crossing that 50 percent threshold would put us well on our way to eventually reaching our long-term Zero Waste goal –90 percent reduction by 2040. If we can eventually get all of that “putrescible” (rotten, organic) trash diverted we could probably switch to bi-weekly trash collection, and that would eventually mean huge cost savings for residents. Even before that at least three-quarters of all ARR customers should be able to use curbside composting to downsize their trash carts and save money, more money than the composting service will cost. The anticipated rate increase is also expected to be smaller for customers with smaller trash cans, which only adds to the incentive for us to trash less and divert more. Still, these savings won’t come if customers don’t know that they can get them, and they won’t know unless we have great educational programs. It’s time for Austin Resource Recovery and other City departments to stop talking AT our communities—especially low income and historically marginalized communities—and and to start letting them speak for themselves. We need to break out of business as usual when it comes to outreach on Zero Waste and other environmental programs. If we do curbside composting now, we will have 3 to 5 years to educate better on recycling before we spend on switching to weekly collection. It’s clear that Zero Waste has big opportunities for protecting our environment while saving us all money. Not all priorities are created equally, however, and curbside composting is an idea whose time has come. Please take a moment to answer the city’s survey, share the link with friends, family, neighbors, and social media and let them know – composting first!